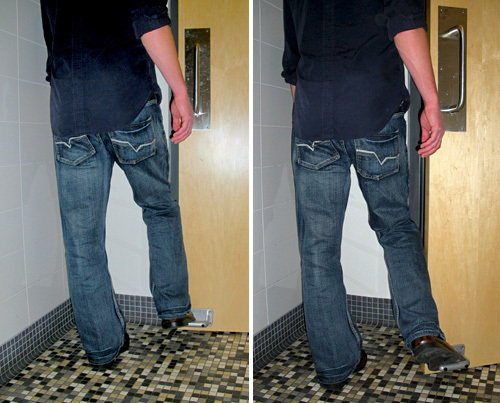 Dear Everywhere With A Public Bathroom: Please Install A Toepener On Every Door | OhGizmo! It’s a ridiculously simple idea, and one that seems totally obvious now, but for some reason it’s taken until the year 2011 for mankind to come up with the Toepener. It’s nothing more than an extra handle that sits at ground level allowing you to open a door with your feet. Besides the obvious health benefits of being installed on a public bathroom door saving you from having to touch a germ-ridden handle with your bare hands, the Toepener looks like it would also make doors easier to open when your hands are full. And it’s just $49.95, so really no public facility has an excuse not to install these. For all you germaphobes that think this is great just wait till you have your foot on that thing and someone rushes in through the door. For anyone interested, the Toepener is launching a new contest starting TODAY through April 30! Nominate a business you think needs the Toepener– whoever receives the most nominations at the end of the contest will earn two free Toepeners! For more information, visit our website. Why not a door that PUSHES OUT THE OTHER WAY? I made something similar while in the army for use with our barracks bathroom out of a piece of rebar over a decade ago. The reason I never bothered to patent it is pretty obvious. It is a piece of L shaped metal with a base to attach to the door. Anyone can make one of these for about 5 bucks, or a polished professional looking one like that for about twelve. It would be like trying to patent paper football, or cats cradle. It looks like a good idea for bathrooms but I think it would be dangerous idea for people passing through the hallways. A person using the bathroom can bump another person accidentally because of the bathroom door’s location. This is a great idea. I actually work at a chain of furniture stores in Los Angeles, and we have the most disgusting bathrooms. It’s not because we don’t clean them, but because the customers constantly thrash them! Something like this makes me feel much better about the bathrooms we’re offering our customers.